Kei Nishikori (錦織圭) is finally back home in Japan. Nishikori currently ranked No. 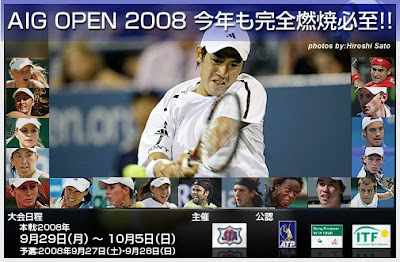 85 in the world will play in the AIG Japan Open Tennis Championships 2008 to be held at the Ariake Colosseum and Ariake Tennis Forest Park's courts in Koto Ward, Tokyo, from Sept. 29 to Oct. 5. 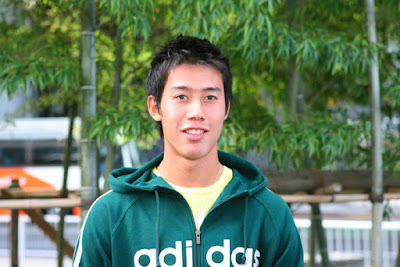 According to Nishikori, Japan is a significant place to play. "The AIG Open is the most important tournament of the year for me because it is extraordinary for me to play in Japan," he said recently in an interview. "If I can attain good results [in the upcoming tournament], this year will be a really good season for me." Nishikori, 18, became the first Japanese to advance to the fourth round of the U.S. Open in 71 years beating David Ferrer along the way. Ferrer, who is the defending champion here at the AIG Open, will also be joining in by other top players like Richard Gasquet, Juan Martin del Potro, Fernando Gonzalez, Gael Monfils and Tommy Robredo. 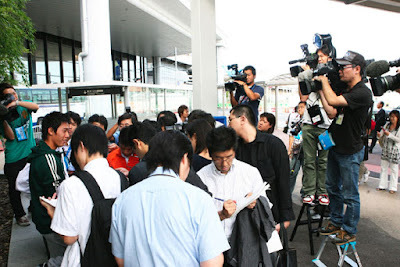 Arriving at the Narita International Airport in the afternoon, Nishikori were flocked and welcomed by a large group of journalists and paparazzi.